When booze gets combined with cake, something great usually happens. 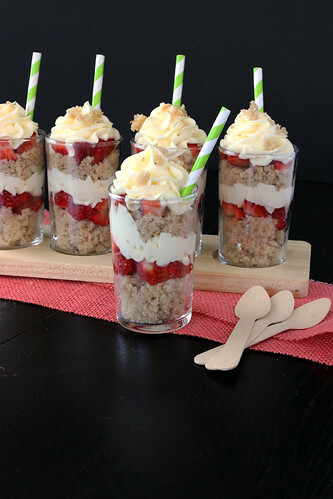 In this case, it’s Strawberry Margarita Cupcake Shooters with fresh strawberries, lime juice, tequila and cake! 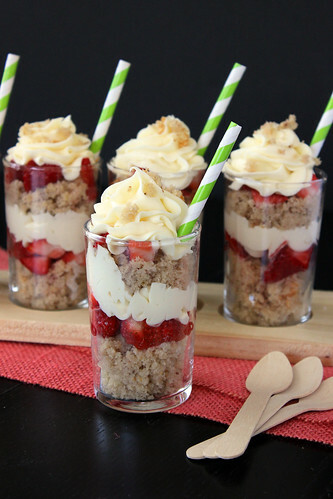 These shooters are made with a strawberry cupcake infused with tequila and tequila cream cheese frosting. These cupcakes are easy to make and can be a fun addition to your Cinco De Mayo festivities! Maybe you feel guilty for drinking a margarita at noon, but you can’t feel bad about eating a cupcake at noon right? That’s my excuse anyway. 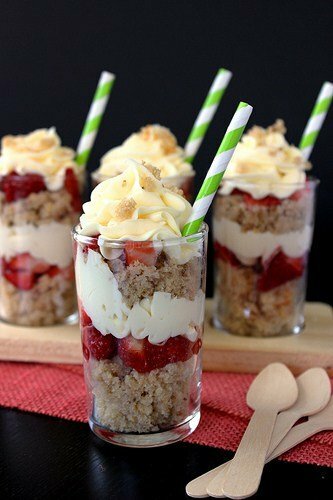 Wash strawberries and use a food processor to finely chop the strawberries into a puree. I used about a 16oz container of strawberries. Set aside. Combine all ingredients together in mixing bowl, except the strawberry puree. Mix on medium speed until all well combined. Slowly add in strawberry puree and mix until well combined. In a lined cupcake pan, fill each liner 2/3 full. Bake at 350° for 14-16 minutes. I usually bake my cupcakes for 12 minutes and then determine how much longer I will need. Allow cupcakes to cool for a few minutes before transferring to a wire rack to cool completely. Cream together the butter and cream cheese until smooth. Add 1 cup powdered sugar, followed by 1 tbsp of tequila and beat on medium speed. Add the remaining 1.5 cups powdered sugar followed by 1 tbsp of tequila, lime juice and lime zest. Beat all ingredients together until smooth. I found that the frosting was too soft to pipe, so I put it in the fridge for at least two hours before using. 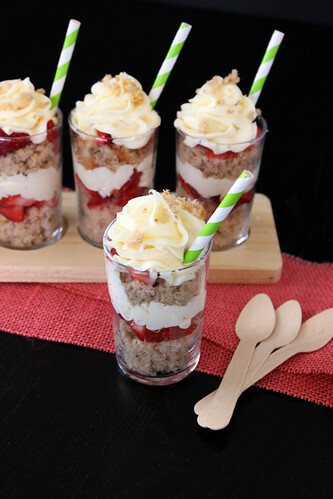 Cut up your remaining fresh strawberries to add to the cupcake shooters and set aside. 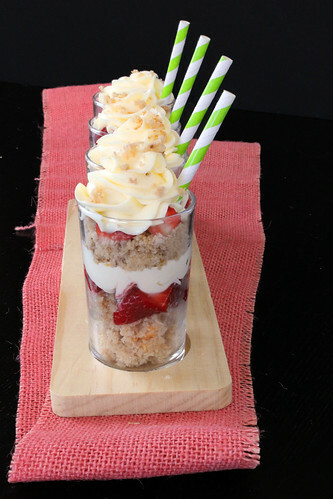 To assemble the shooters, start by layering the bottom with cupcake crumbles (I used about 1 cupcake per shooter). Next, add some fresh strawberries on top followed by a layer of tequila cream cheese frosting. Repeat a second time and top it off with additional cupcake crumbs. Keep refrigerated until ready to serve. Allow shooters come to room temperature by removing them from the fridge 20 minutes before serving. What’s an easy, non Amazon way, to purchase “shooter” glasses? Thanks! I’ll be trying these for my Cinco de Mayo party this weekend. I realize this is an older post, but do you remember what size shot glasses you used? I’m trying to find similar ones, but Amazon has a range of sizes from 1.5oz to 3oz. Hi Kelsey, I think these were made using a 5oz glass? I wanna say it was from a brand called Libbys. If all else fails, mini mason jars would also work great! How many shooters does this recipe make?